Speckled Hen Free Range eggs are the exclusive suppliers of Free Range eggs under the Midlands Eggs label. Set in the Dargle Valley all Speckled Hen laying hens are free to roam and express their natural behaviour in a safe and stress free environment. While in the UK Vicky and Craig observed the trend towards free range chicken. And having realised that cages were no fun for animals, they decided to try out free range egg farming. 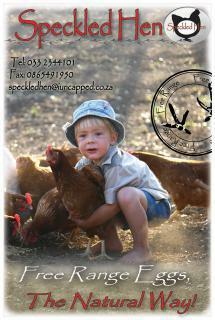 In 2010 they opened the doors of Highveld Freerange farm, which now produces 4000 eggs a day. Highveld eggs are sold as Speckled Hen Free Range Eggs and are available in the Midlands at Pick ‘n Pay’s and Spars, Pick ‘n Pay’s in Pietermaritzburg.